So you want to write for Threat Quality Press. Welcome to our website, easily amused strangers! Hey, who wouldn’t? We have multiple(!) regular readers. We’ve gotten into at least one major flame war with a conservative blog over, oh, who can remember these days (something about an election?). We have many celebrity friends. And – this is not something I generally share, since we try to keep this a family-friendly site, but – since our one-year anniversary it’s been a nonstop banging-and-coke-fest up in here*. Just saying. It’s good to write for Threat Quality. But just how are you going to write an interesting post? I have no idea. But GOD HELP YOU IF YOU DON’T let’s look at some commonly popular themes, if our blog stats are to be believed. I trust you’ve found this informative, and will be tailoring your writing accordingly. Have at it! I am a regular reader. I must say though that I am disaapointed by the dearth of midget jokes around here. How that does not have it’s own tag is beyond me. Please, no more “Montauk Monster” pics: They just break my heart… so…pitiful-looking. Was it alone…during its obviously tragic passing, I mean? Tell me it was better this way, Holland—tell me IT WAS BETTER! The Montauk Monster – not really a monster at all, really, simply misunderstood (though a wee bit racist, truth be told) was surrounded by friends and loved ones as it passed. Until it disappeared, into some dude’s back yard, where it could be seen serenely rising from the grave via grainy cameraphone footage. Or possibly it was a baby Cloverfield monster. I kinda lost track of the story after the first day or so. 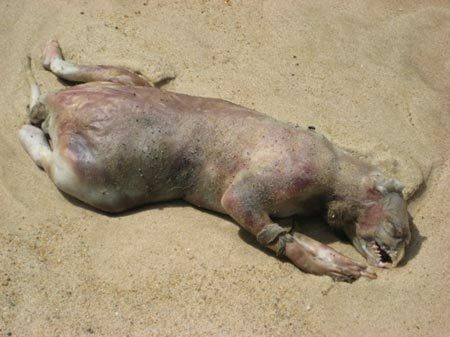 I believe the Montauk Monster was a decrepit dog, or possibly just the product of a hoax. And your 4 very loyal readers loved it.